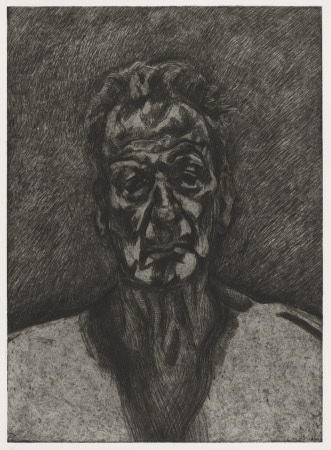 Manhattan - Lucian Freud has a talent for the labor of painting, which one might distinguish from a talent for painting itself. Seven decades of practice have afforded him moments of painterly facility, and they ring flat compared to areas where he crawls, ant-like, over depicted forms with a thickly loaded brush. So etching suits him, the needle's resistant contact with the plate echoing the hard, relentless push that characterizes his oils. An Impressionist stroke applied with a Gothic fondness for detail, the lines build up into a thicket of uncomfortable but powerful form, textured, nuanced, weighty, and in spite of itself, luminous. I believe you are a big Freud fan, Franklin. I can see what is good about his work and he has a real worked-out personal method but for me these things are offset by all that unreconsidered overworking and clammy surface. I find it not bad but depressing, and I don't have this reaction to very much art. Sengai claimed that the true method was no method, and Freud has almost nothing except a method. I can see not feeling charmed by it. They have a self-mocking air that stops them from coming off as flat-out depressing for me, something like genuine fondness and sympathy for all that sagging flesh. For some reason these images (the paintings) bring to mind Wyeth's Helga pictures. That may simply be a quirky free association of no particular significance, but it came into my head. In other words, I sense a certain kind of banality here, despite all the laborious obsessiveness. I find myself liking Freud less over time. I suppose his "legend" status and material success, the fawning treatment he gets from certain quarters, distasteful associations like the pregnant Kate Moss business, and the excessive focus on him as a character may all be rubbing me the wrong way. In any case, I feel more and more that he's overrated, even though he's infinitely more respectable than a mere clown like Hirst or a charlatan like Koons, to cite other "legends." Which I'm doing just to bug Franklin. I haven't seen a lot of Freud's work, but what I have seen is much better than in reproduction and I kind of like it. At the same time, I don't get the impression that Freud has any fondness for the people he depicts; like my feelings for Pearlstein -- but for different reasons -- I feel Freud has a certain contempt or dislike or at least disdain for his models. Certainly Freud seems to go out of his way to make his sitters as ugly as possible. Pearlstein always strikes me as just not caring any more for people than for furniture, and his titles -- "Model with Dreadlocks" -- seem to me to bear that out. 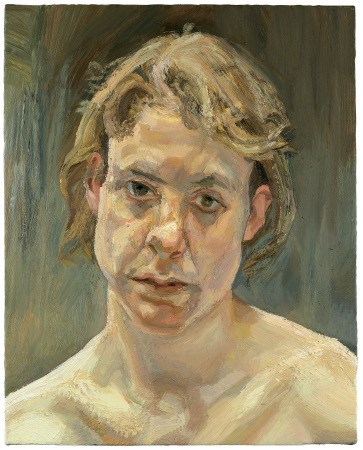 It seems fashionable for figurative artists to have zero humanism in their souls, which I think is a damned shame. Thank you for the html info Chris. 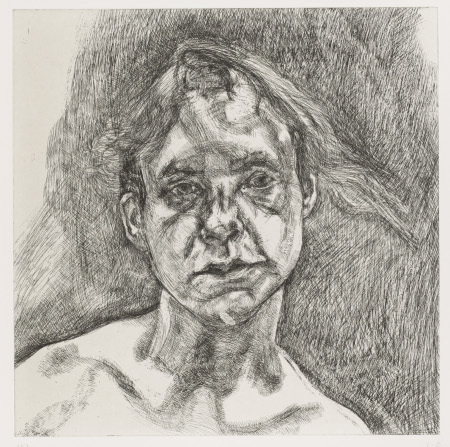 I take that view of Freud's work to task in my review of his etching show currently at MoMA. I will post a link to the review on my blog when it is finally posted in a few days.